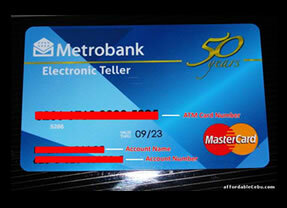 For this special article I listed the needed requirements when applying to get a Metrobank Debit Mastercard. Just last month June 2015, I applied and got my card from Metrobank as easy as eating peanuts and with no hassle. Please refer to the list below for more details. 1. ₱ 2,000.00 (two thousand pesos) - this is the card's maintaining balance. 4. If you have a job you must have your TIN number. 5. Application form - the bank will provide this. 2. Can I check my balance online? YES, you can visit here personal.metrobankdirect.com. If you do not have an account yet, you have to register first. 3. This card is can be used to withdraw your Nuffnang and Innity money earnings.